About a month ago, Gary wrote an entry which documented another of W’s culinary exploits. 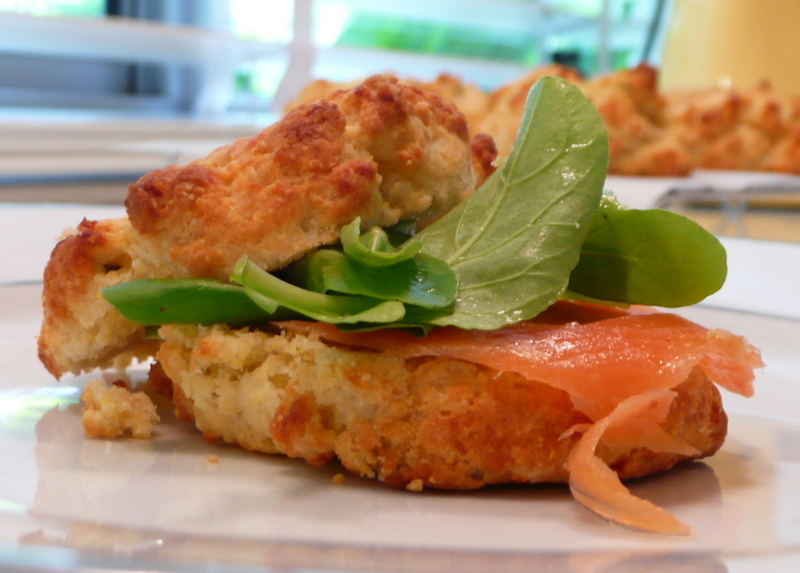 The recipe in question was Crispy Parmesan Biscuits served with lemon butter, smoked salmon and rocket (arugula). The photos turned out wonderfully (no surprise there) and since I’m a biscuit man, I decided to try the recipe. When it comes to biscuits, there are many schools of thought. I was raised on a rolled, buttermilk baking powder biscuit. But I enjoy exploring other types. This Food Network recipe is also has buttermilk and baking soda, but uses butter and olive oil instead of shortening, also has some corn meal in it, and is formed as a drop biscuit. Different textures, to be sure. It also has a hefty 5.5 ounces of grated Parmesan cheese! 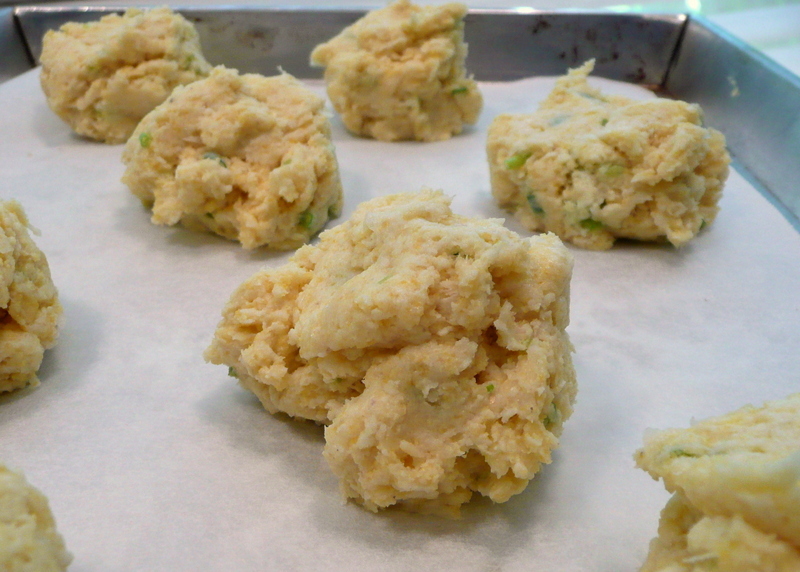 The precooked biscuits, with flecks of green onion, looked appetizing. I wasn’t sure how large to make them. I also didn’t know how much they would spread out so I baked them in two batches instead of one. As it turns out, they don’t spread so much as they puff up, so fitting them more tightly on the tray would have been fine. Fresh out of the oven, they had a lovely, cheesy smell. I let them cool on a rack, as instructed, before slicing and making the little sandwiches. While they cooled, I prepared the lemon butter, combining a healthy dose of lemon jest with softened butter. The finished product, probably a little skimpy on the rocket and the salmon. They look great, but I have to tell you, they were a mess. 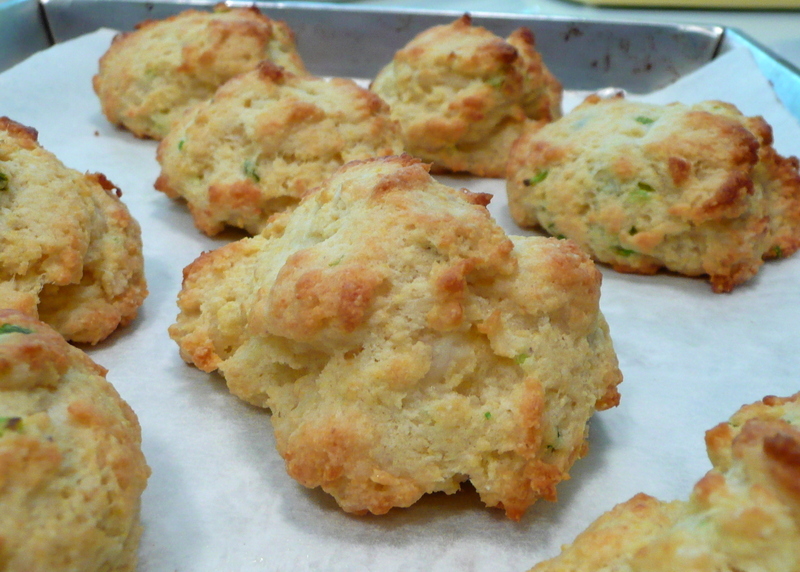 The biscuits are very crumbly because of the use of liquid fat and butter instead of a solid shortening. Shortening = flakiness, butter = flavor + light crumble, oil = fine crumb. Also, the biscuits themselves were oily to the point of being greasy. I followed the recipe precisely, but wanted to stop and wash my hands after every few bites, they were so oily. The flavor combination was excellent, though. Parmesan and buttermilk, the zest of the lemon, fatty smokiness the salmon, bitter crunch of the rocket. Wanting to perfect this, or at least get a heck of a lot better, I’m going to revisit this recipe in the next few weeks. I’ll start instead with my biscuit recipe, and substitute in some of the ideas from the Food Network’s recipe and see if we can get something that has the same flavor profile but with more structure. Maybe some olive oil-flavored crisco? sounds yummy! @slmret – That’s a good idea. We only have regular Crisco here, not even the sticks. In fact, we don’t even have the trans-fats free formulation yet. I’ve seriously considered buying some in the US and bringing it over! I can smell the aroma of the biscuits! Will be staying tuned for your next experiment! Here in typhoon ravaged Philippines, what you posted is truly a feast. Wow, what a coincidence… I just made this last week! I also found the biscuit recipe via the Food Network magazine, and was going to reproduce for the blog haha :)This looks wonderful though, I never thought of completing it with smoked salmon as you did here. Wonderful. Those look good! Let us know how your next round of experimentation goes! @CurryPuffy – Their aroma was really great. I told W that I’d share whatever modified recipe I came up with, assuming it works out any better. @Norcani – I try very hard to remember that I’m fortunate to have the luxury of choice when it comes to food and to not forget that there are many who are struggling just to survive. @chow@ireallylikefood – That is a funny coincidence. Biscuits must be on everyone’s mind these days. The recipe also suggested prosciutto as an alternative to the smoked salmon, which would be very nice, too. @TheCheshireGrins – Will do just as soon as I’ve tried bagels. There’s a batch of dough slow-proofing tonight for shaping, boiling and baking in the morning. @christine24666 – I’m honored to inspire you. @yang1815 – Wish you could have tried them. I’ve just realized that I would love to sit in your kitchen sometimes and watch how you make stuff.Or maybe even jump in to help sometime Before I took on cooking, I have always been intimidated by all those foreign ingredients, which pretty much is everything from flour and on.Ever since I started, everything I make just seemed so easy afterward. I think I just need to watch the whole process live or get my hands in them. Looks delicious! I’m looking forward to seeing how the modified recipe turns out. A crumbly biscuit would bug me too. Son#1 just splurged and bought smoked salmon. He was going to eat it with a special beer – this looks like a much better way to go. Greasy biscuits are why I avoid buscuits all together. @Wangium – Jason, you are always more than welcome to come over and help cook. Seriously. As for the intimidation factor, I know what you mean. When I moved out from home after university, I didn’t really know much about cooking. It was sheer curiosity and a willingness to blunder that gave me the confidence to start trying various dishes. And each time, I’ve discovered the same thing, that recipes are just a matter of following directions and getting in there and trying it. @alextebow – I’ll let you know how it turns out! @christao408 – I know – weird. But the beer is from somewhere in Scotland. It is called Skullsplitter after some Viking ruler. My son has a thing for cheese and smoked salmon. At the age of 6 we had to physically remove him from the Epcot Swedish smorgasbord before he made himself sick. I never thought a 6 yr old would be able to consume that quantity of smoked salmon and goat cheese (it was a dark golden brown and slightly sweet). He was so stuffed he just wanted to laydown for a nap – at DISNEY! If you like beer I’m told this is a really good one… to have with salmon. Hmm.. I’ll have to check this out. I know my bf won’t try it though as he doesn’t like cheese. @ElusiveWords – Well, the nice thing about it is that they aren’t “cheesy” per se. Just have a bit of a nutty parmesan flavor to them. You could also lessen the amount of cheese without too much problem, making is even more subtle.